I have several Multi-Select parameters in my report. I am trying to find a way to pass in multiple values for a single parameter in the web query string? If I pass in a single value, it works fine. The report runs fine selecting multiple choices for a single param. My trouble lies in the web query string. This is what I use when passing a multi-select param to another multi-select param. This is one of the poor supported features in SQL Reporting Services. What you need to do is pass all of your selected items as a single string to your stored procedure. Each element within the string will be separated by a comma. What I then do is split the string using a function that returns the provided string as a table. See below. I hope this you find this solution to be of use. Please feel free to pose any questions you may have. John Sansom and Ed Harper have great solutions. However, I was unable to get them to work when dealing with ID fields (i.e. Integers). I modified the split function below to CAST the values as integers so the table will join with primary key columns. I also commented the code and added a column for order, in case the delimited list order was significant. Then in your SQL statement's WHERE clause use the instring function to check for a match. I ran into a problem with the otherwise wonderful fn_MVParam. SSRS 2005 sent data with an apostrophe as 2 quotes. I added one line to fix this. My version of the fn also uses varchar instead of nvarchar. Just a comment - I ran into a world of hurt trying to get an IN clause to work in a connection to Oracle 10g. I don't think the rewritten query can be correctly passed to a 10g db. I had to drop the multi-value completely. The query would return data only when a single value (from the multi-value parameter selector) was chosen. I tried the MS and Oracle drivers with the same results. I'd love to hear if anyone has had success with this. Create your multi-select parameter MYPARAMETER using whatever source of available values (probably a dataset). In my case, the multi-select was from a bunch of TEXT entries, but I'm sure with some tweaking it would work with other types. If you want Select All to be the default position, set the same source as the default. This gives you your user interface, but the parameter created is not the parameter passed to my SQL. doesn't really matter (since it will not be displayed). It is this parameter which gets passed to SQL, which just happens to be a searchable string but which SQL handles like any piece of text. I hope putting these fragments of answers together helps somebody find what they're looking for. This is about using the join function to save a multi-value parameter and then restoring the exact same selections from the database later. I just finished a report that had requirements that the parameters must be saved, and when the report is opened again (the report is passed an OrderID paramater), the values previously chosen by the user must be once again selected. The report used a half of dozen parameters, each one had its own data set and resulting drop down list. The parameters were dependent upon the previous parameters to narrow the scope of the final selection, and when the report was "viewed" a stored procedure was called to populate. The stored procedure received each of the parameters passed to it from the report. It checked a storage table in the database to see if any parameters were saved for that OrderID. If not, then it saved all the parameters. If so, it updated all of the parameters for that order (this is the case where the user changes their mind later). When the report runs, there is a dataset dsParameters which is SQL text that goes out and selects the single row for that orderID if there is one. Each of the parameters in the report gets its default value from this dataset, and its selection list from a dataset dedicated to that parameter. I ran into trouble with the multi-select parameter. I used a join(@Value,",") command in the main dataset parameter list, passing to the stored procedure a comma delimited string. But how to restore it? You can't feed the comma delimited string back to the default values box of the parameter. Every time the form opens, this dataset checks the database for a saved string for this multi-valued parameter. If there is not one, it returns null. If there is on, it parses out the commas and creates a row for each of the values. Then the default values box is set to this dataset, and fldDesc. It works! When I choose one or many, they save and replenish when the form is opened again. I hope this helps. I searched for a while and did not find any mention of saving the join string in a database and then parsing it out in a dataset. It would probably be easier to add the multi values to a table first and then you can join or whatever you'd like (even with wildcards) or save the data to another table for later use (or even add the values to another table). I'd love to figure out a way to do it without dynamic SQL but I don't think it'll work due to the way SSRS passes the parameters to the actual query. If someone knows better, please let me know. 1)define a Report-Parameter ( e.g. 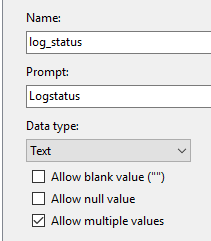 @log_status ) and check "Allow multiple values"
3a) in the Query-Tab enter your query: e.g. 3b) in the Parameters-Tab enter your Parameter, e.g. The below solution worked for me. In the parameter tab of your dataset properties click on the expression icon (!http://chittagongit.com//images/fx-icon/fx-icon-16.jpg [fx symbol]) beside the parameter you need to allow comma delimited entry for. If you want to pass multiple values to RS via a query string all you need to do is repeat the report parameter for each value. For example; I have a RS column called COLS and this column expects one or more values. I needed solution for Oracle and I found this worked for me inside my query for my report for DB>=10g. Not the answer you're looking for? Browse other questions tagged sql reporting-services parameters query-string or ask your own question. How do I utilize a multi-value Parameter in a query for SSRS report? How to display “All Selected” when parameter (Select All) is selected in SSRS?